Electronics are an integral part of our daily lives. Everything from our smart phones to our cars includes electronic components. At the heart of these electronics is the printed circuit board, also known as a PCB. Most people recognize printed circuit boards when they see them. These are the small green chips covered in lines and copper parts you’ll find at the heart of gutted electronic devices. Made with fiberglass, copper lines and other metal parts, these boards are held together with epoxy and insulated with a solder mask. This solder mask is where that characteristic green color comes from. However, have you ever observed those boards with components solidly stuck on? Never regard them as just decorations of a PCB board. An advanced circuit board won’t be able to give its functionality until components are mounted on it. A PCB with components mounted on is called an assembled PCB and the manufacturing process is called PCB assembly or PCBA for short. The copper lines on bare board, called traces, electrically link connectors and components to each other. They run signals between these features, allowing the circuit board to function in a specifically designed way. These functions range from the simple to the complex, and yet the size of PCBs can be smaller than a thumbnail. So how exactly are these devices made? 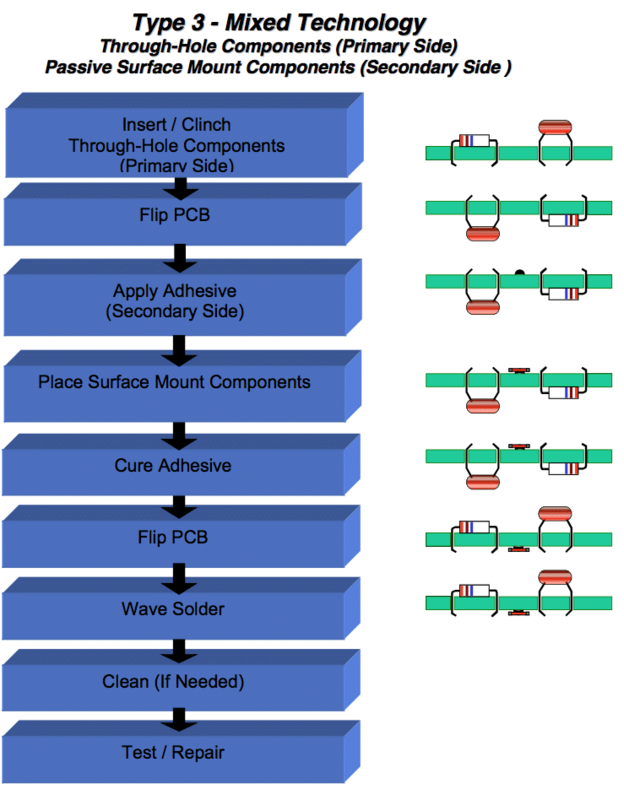 The PCB assembly process is a simple one, consisting of several automated and manual steps. With each step of the process, a board manufacturer has both manual and automated options from which to choose. To help you better understand the PCBA process from start to finish, we’ve explained each step in detail below. The solder paste itself is a greyish substance consisting of tiny balls of metal, also known as solder. The composition of these tiny metal balls is 96.5% tin, 3% silver and 0.5% copper. The solder paste mixes solder with a flux, which is a chemical designed help the solder melt and bond to a surface. Solder paste appears as a grey paste and must be applied to the board at exactly the right places and in precisely the right amounts. 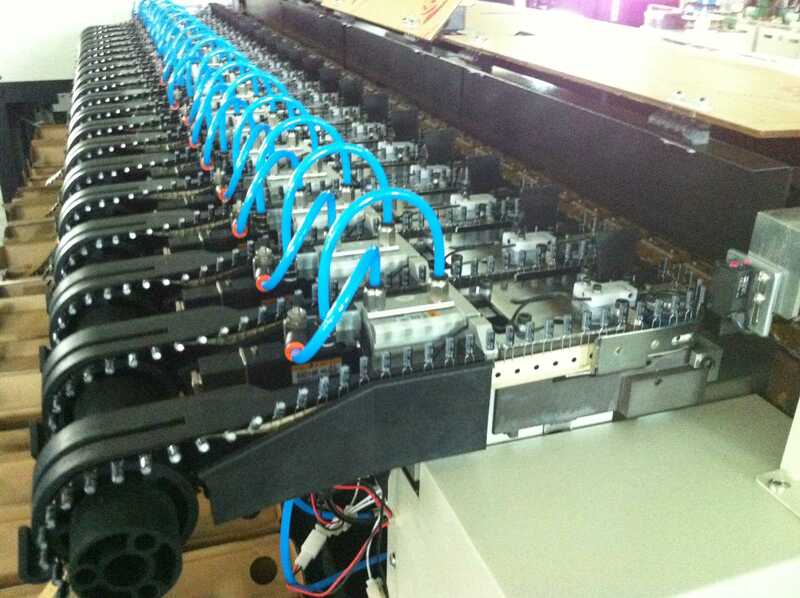 In a professional PCBA line, a mechanical fixture holds the PCB and solder stencil in place. An applicator then places solder paste on the intended areas in precise amounts. The machine then spreads the paste across the stencil, applying it evenly to every open area. After removing the stencil, the solder paste remains in the intended locations. After applying the solder paste to the PCB board, the PCBA process moves on to the pick and place machine, a robotic device places surface mount components, or SMDs, on a prepared PCB. SMDs account for most non-connector components on PCBs today. 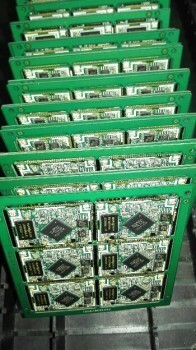 These SMDs are then soldered on to the surface of the board in the next step of PCBA process. The device starts the pick and place process by picking up a PCB board with a vacuum grip and moving it to the pick and place station. The robot then orients the PCB at the station and begins applying the SMTs to the PCB surface. These components are placed on top of the soldering paste in preprogrammed locations. Once the solder paste and surface mount components are all in place, they need to remain there. This means the solder paste needs to solidify, adhering components to the board. 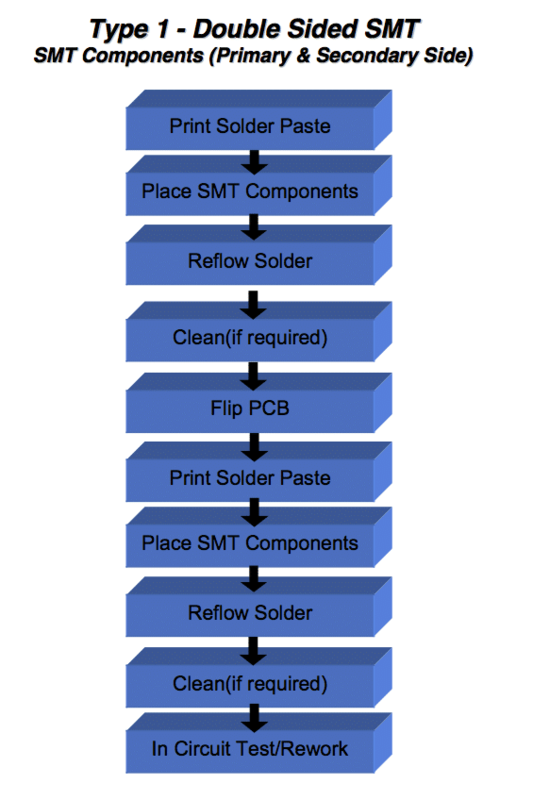 PCB assembly accomplishes this through a process called “reflow”. After the pick and place process concludes, the PCB board is transferred to a conveyor belt. This conveyor belt moves through a large reflow oven, which is somewhat like a commercial pizza oven. This oven consists of a series of heaters which gradually heat the board to temperatures around 250 degrees Celsius, or 480 degrees Fahrenheit. This is hot enough to melt the solder in the solder paste. Once the solder melts, the PCB continues to move through the oven. It passes through a series of cooler heaters, which allows the melted solder to cool and solidify in a controlled manner. This creates a permanent solder joint to connect the SMDs to the PCB. Many PCBAs require special consideration during reflow, especially for two-sided PCB Assembly. Two-sided PCB assembly need stenciling and reflowing each side separately. First, the side with fewer and smaller parts is stenciled, placed and reflowed, followed by the other side. Once the surface mount components are soldered in place after the reflow process, which doesn’t stand for completion of PCBA and the assembled board needs to be tested for functionality. Often, movement during the reflow process will result in poor connection quality or a complete lack of a connection. Shorts are also a common side effect of this movement, as misplaced components can sometimes connect portions of the circuit that should not connect. • Manual Checks: Despite upcoming development trend of automated and smart manufacturing, manual checks are still relied on in PCB assembly process. For smaller batches, an in-person visual inspection by a designer is an effective method to ensure the quality of a PCB after the reflow process. However, this method becomes increasingly impractical and inaccurate as the number of inspected boards increases. Looking at such small components for more than an hour can lead to optical fatigue, resulting in less accurate inspections. • Automatic Optical Inspection: Automatic optical inspection is a more appropriate inspection method for larger batches of PCBAs. An automatic optical inspection machine, also known as an AOI machine, uses a series of high-powered cameras to “see” PCBs. These cameras are arranged at different angles to view solder connections. Different quality solder connections reflect light in different ways, allowing the AOI to recognize a lower-quality solder. The AOI does this at a very high speed, allowing it to process a high quantity of PCBs in a relatively short time. • X-ray Inspection: Yet another method of inspection involves x-rays. This is a less common inspection method — it’s used most often for more complex or layered PCBs. The X-ray allows a viewer to see through layers and visualize lower layers to identify any potentially hidden problems. The fate of a malfunctioning board depends on PCBA company’s standards, they will be sent back to be cleared and reworked, or scrapped. Whether an inspection finds one of these mistakes or not, the next step of the process is to test the part to make sure it does what it’s supposed to do. This involves testing the PCB connections for quality. Boards requiring programming or calibration require even more steps to test proper functionality. Such inspections can occur regularly after the reflow process to identify any potential problems. These regular checks can ensure that errors are found and fixed as soon as possible, which helps both the manufacturer and the designer save time, labor and materials. As a traditional PCB assembly method, thru-hole mounting process is accomplished through collaboration of manual procedure and automatic procedure. • Step 1: Components Placement – This step is achieved manually by professional engineering staff. 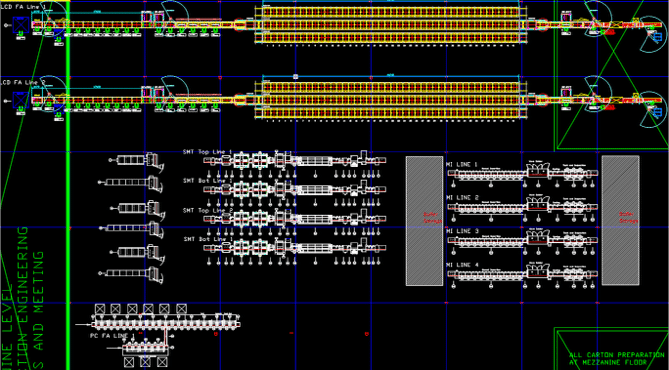 Engineers need to quickly, yet precisely place components on corresponding positions based on client’s PCB design files. Component placement must conform to regulations and operation standards of thru-hole mounting process to guarantee high quality end products. For example, they have to clarify polarity and orientation of components, to stop operating component from affecting ambient components, to make completed component placement compatible with corresponding standards and to wear anti-static wristbands when dealing with static-sensitive components like ICs. • Step 2: Inspection & Rectification – Once component placement is completed, the board is then placed in a matching transport frame where board with components plugged in will be automatically inspected so as to determine whether components are accurately placed. If issues concerning component placement are observed, it’s easy to get them rectified immediately as well. After all, this takes place prior to soldering in PCBA process. • Step 3: Wave Soldering – Now the THT components should be accurately soldered onto circuit board. In the wave soldering system, the board moves slowly over a wave of liquid solder at high temperature, approximately 500°F. Afterwards, all leads or wires connections can be successfully obtained so that thru-hole components are firmly attached to the board. Compared with thru-hole mounting process, surface mounting process stands out in terms of manufacturing efficiency because it features a totally automatic mounting PCB assembly process from solder paste printing, pick and place and reflow soldering. • Step 1: Solder Paste Printing – Solder paste is applied on the board through a solder paste printer. 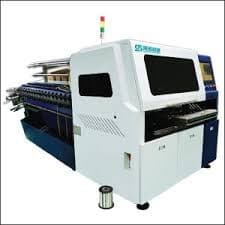 A template ensures that solder paste can be accurately left on correct places where components will be mounted, which is also called stencil or solder screen. Because quality of solder paste printing is directly associated with quality of soldering, PCBA manufacturers focusing on high quality products usually carry out inspections after solder paste printing through a solder paste inspector. This inspection guarantees printing has achieved regulations and standards. If defects are found on solder paste printing, printing has to be reworked or solder paste will be washed off prior to second printing. • Step 2: Components Mounting – After coming out of solder paste printer, PCB will be auto-sent to pick-and-place machine where components or ICs will be mounted on corresponding pads in the effect of tension of solder paste. Components are mounted on PCB board through component reels in the machine. Similar to film reels, component reels carrying components rotate to provide parts to the machine, which will quickly stick parts to the board. • Step 3: Reflow Soldering – After every component is placed, the board passes through a 23-foot-long furnace. A temperature of 500°F causes the solder paste to liquefy. Now the SMD components are bound firmly to the board. THT PCB Assembly auto insertion machine. What is the ODM Product Solutions Process? We provide the one-stop for ODM, OEM, PCB manufacturing and PCB assembly services which can help you effectively shorten the sourcing time and accelerate production to get more market share. From the design, procurement of materials, testing and mass production to the packaging and shipping, we can make your docking seamless. We supply high-end production equipment, advanced management methods, experienced engineers, and skilled workers to ensure the highest quality, efficiency, and specifications. We are on track to becoming the world’s leading supplier of electronic manufacturing services (EMS) in end-to-end solutions and products for customers in the area of consumer electronics, automation, medical, automotive, security, telecommunications, networking and intelligent devices, and more. 1. 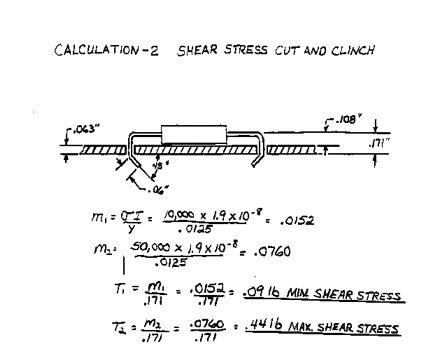 Feasibility analysis for technical, underlying application, and the mold. 2. Schedule test and production plans. 3. Submit program proposal including the overall progress of the project, the specific implementation of program, cycle, and cost estimates and other aspects of information. 4. Schedule the hardware development: circuit diagram design, PCB circuit and shape design, sample processing, and other links. 5. Schedule the software development: the design of customer UI, driver bugging, application development and debugging. 6. Schedule the mold development: through CAD, 3D works build product outline, make sample and perform debugging. 7. Test the Sample Stage: the results of the integration of technical samples, functional stability testing. 8. Small batch stage: implement the customer acceptance test (UAT), through the actual use of the function, the application of feedback to return and make alterations toward improvement. 10. File all of the project technical documentation. How Do You Store Components Long-Term? The increasing requirement to store components for long periods of time creates challenges when accurately accounting for appropriate storage parameters. Whether you're protecting your ability to reproduce an identical product in the next year, safeguarding your inventory, or guaranteeing your price point, here are some considerations to make when storing your components long term. Shelf life for components is determined by both the Bag Seal Date and the Humidity Indicator Card (HIC). 12 Months - 2 Years (max). Using a Dry Packs and/or Dry Atmosphere Cabinet to control moisture is essential for long-term storage of components. Low humidity can be maintained with dry air or Nitrogen and the ability to regain optimal moisture levels within 1 hour. Temperature is a critical factor when considering all aspects of preservation of components, especially oxidation & intermetallic formation. The optimum parameters are subject to the details of each component as labeled on related packaging. Use the detailed information according to each component. As a general rule, however, in order to control for oxidation, corrosion, and intermetallic formation it is recommended to store components for no more than 2 years, at 12 ° Celsius, <5%RH. Three general classes for the intended end use of electronic assemblies have been established. As applications and functionality increase there may be overlap of equipment between classes. The owner of the application has the responsibility to determine the class that applies. Although a single class may be referenced, specific requirements defined in other classes may apply as well. If a class is not stated for a criterion then the single criterion applies to all classes. Class 1: Consumer Products: This class of product includes non-critical applications which shall be reliable and cost effective but for which extended life is not the primary objective. Examples include products manufactured for general consumer applications. Class 2 – General Industrial. This class includes high performance commercial and industrial products in which extended life if required but for which uninterrupted service is not critical. Application and environmental considerations should be taken into account. Class 3 – High Reliability. Equipment in this class includes those equipment which continued performance is critical, equipment whose downtime cannot be tolerated, or equipment used as a life support item. Unless otherwise specified, Class 3 shall be used for soldering requirements on military electronic equipment. 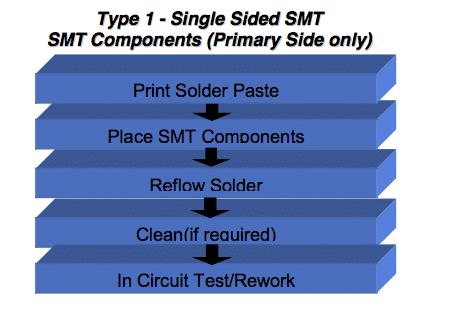 SMC’s only are placed on one or both sides of a printed circuit board. The components are attached via the Reflow soldering process. A combination of both surface mount and insertion mounted components on a printed circuit board. Both SMC’s and IMC’s are assembled on the top side of the board while SMC’s only are attached to the bottom of the board. 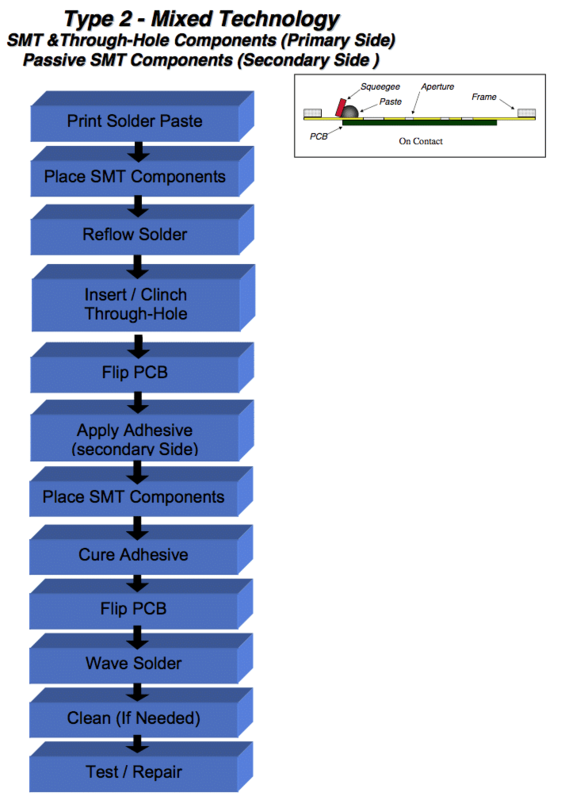 Top side smt components are Reflow soldered, while the through hole and bottom side smt components are Wave soldered. IMC’s are assembled on the top side of the board while SMC’s only are attached to the bottom of the board. The components are soldered in place via the Wave solder process. The fast growth of these applications and advanced packages has led to the development of high density boards. As the industry increases the use of these boards and packages in its products, two of the greatest challenges that it will face are; establishing effective printing guidelines and utilizing equipment that can reliably produce a wide variety of assemblies. A company’s success or failure in the surface mount industry will weigh heavily on its ability to adapt to automated manufacturing practices through innovative product design and development. Manufacturers can effectively compete in the electronics marketplace today only by utilizing automated equipment throughout the entire SMC assembly process. This includes addressing changes in the SMC production process from initial board printing to final inspection. The companies that do not act positively on these factors and successfully adapt to changing trends in the electronics market will find their business being lost to competitors and foreign ventures. Available time is 80 hours (16hours x 5days)! See a Machine You Need? Thank you for watching our AI/SMT Video Catalog where we featured Pick & Place Machines, Axial Insertion Machines, Radial Insertion Machines, Printers, Wave Soldering Machines, Odd-Form Machines, SMT Stencil Cleaners, and much more. Did you see a SMT, THT, or other machine, spare part, or service you need? Request a quote and we will guide you through the rest. Reed Switches, or Herkons, are extremely useful for many electronic applications. Reed Switches work by means of magnetism in reed relays and for electrical circuit control. In the presence of a magnetic field the reed will either open or close, depending on it’s original positioning and purpose. They are extremely useful as they are hermetically sealed and can operate in almost any environment. Made for highly reliable switching, major advantages to Reed Switches include their capability for low contact resistance, do not require a supply current, offer non-touch switching, no minimum switching current necessary for them to function, except for Tungsten contact materials. In addition, Reed Switches are highly economical, suitable for many harsh environments, and deliver billions of operations throughout their lifetime. Common applications for Reed Switches include gear speed and direction sensing, window and door sensors for security alarms, bridge operator controls in airplane docking, safety vane sensor applications, high voltage relays in the power industry, fuel pumping stations sensors, ferrous part detection, and hibernation mode sensing when laptops are closed. There are many more growing applications for the very useful Reed Switch. Reed Switch insertion into PCBs have historically been conducted by means of manual labor, by hand. As Auto Insertion mechanisms have advanced, there are new technologies on the market that can accommodate these highly useful switches via automated machines. Through Hole Technologies (THT) have advanced to now offer mechanized equipment to automate an assembly line that requires Reed Switch insertion. The first ever Reed Switch Machine is now available on the market for production assembly and auto insertion uses. This will make electronic products requiring Reed Switches easier to produce, faster, and more affordable for an entire manufacturing production. For a brief time, we will be giving away a FREE Gerber File. For the first time, Southern Machinery is giving away a FREE Gerber File! If you need help with your design process, we are gladly here to help. Let us make your manufacturing set-up easy and efficient. 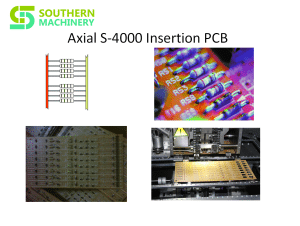 We at Southern Machinery know and understand what is needed for a successful PCB Assembly. If you need pharmacy guidance with design, CAD, equipment configuration, training, just ask! Southern Machinery is not just a place to buy machines, but also a place to get your technical questions answered. So ask us! We want to help you find your PCBA solutions. While in attendance at the 2017 National Association of Music Merchants (NAMM) Show last month we found one thing to be true… THT Equipment is far from dead. The music industry continues to require robust and durable components for high quality and heavy duty gear. GEAR, GEAR, GEAR! And the better the gear the more likely THT was involved in the assembly. Proving that THT is not just surviving but thriving in our high-tech world. But there are many missing links! Many of these specialty components are still placed by hand and many more are still IMPORTED. Opportunities abound for manufacturers to bring all assembly, quality control, and profits back home. Quality is the name of the game when it comes to being #1 in any product category but costs sometimes hold back some manufacturers. According to Joel Menchey, Menchey Music Service, import costs for audio manufacturers are the highest of all costs. This doesn’t have to be so. 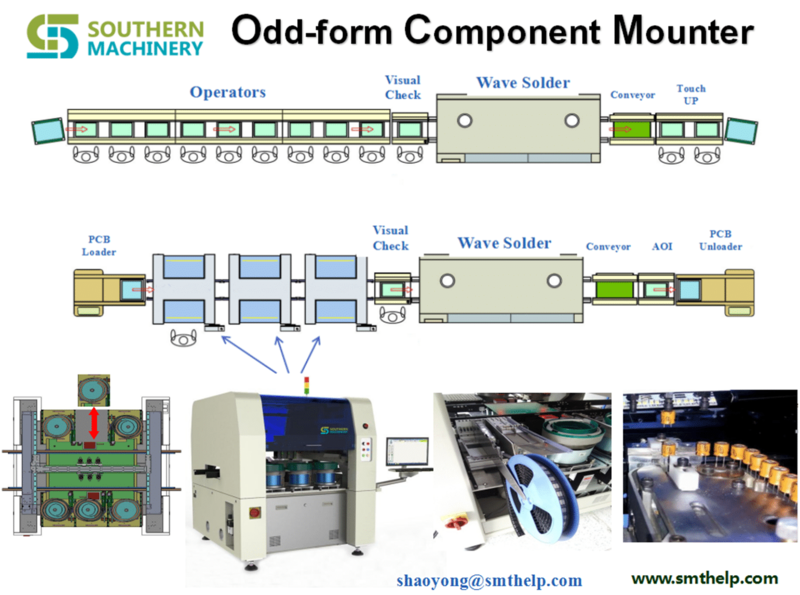 We at Southern Machinery have the solutions to lower costs and improve your manufacturing assembly quality! Our S-600-OF Through-hole & Surface Mounting Multifunction Machine paves the way to incorporate THT with SMT technologies. We can help you design the exact machine for your needs, ordered to spec. It’s a simple conversation for a huge shift in ideology and savings. CLICK HERE for more HELP with your THT Equipment! Practical placement speed to 18,000 cph. audion , IC, SOTs, SOPs, QFPs and CSPs, and THT components. Feeder racks can accommodate a mix of tape feeders and IC tube/stick feeders or 5 THT components feeder. Bottom fixed-camera vision system for fast, accurate alignment. Ball screw drive and heavy-duty, uni-body construction ensure smooth, high-speed movement and high accuracy and repeatability. Maximum No. of Feeder Ports 30 Or 5 THT components Feeders. Southern Machinery Updates & News!